"Classic Chinese" and "Archaic Chinese" redirect here. For the traditional style of written Chinese, see Classical Chinese. Old Chinese, also called Archaic Chinese in older works, is the oldest attested stage of Chinese, and the ancestor of all modern varieties of Chinese. 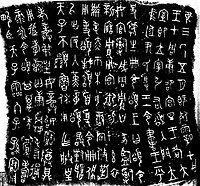 [a] The earliest examples of Chinese are divinatory inscriptions on oracle bones from around 1250 BC, in the late Shang dynasty. Bronze inscriptions became plentiful during the following Zhou dynasty. The latter part of the Zhou period saw a flowering of literature, including classical works such as the Analects, the Mencius, and the Zuo zhuan. These works served as models for Literary Chinese (or Classical Chinese), which remained the written standard until the early twentieth century, thus preserving the vocabulary and grammar of late Old Chinese. Old Chinese was written with an early form of Chinese characters, with each character representing a monosyllabic word. Although the script is not alphabetic, most characters were created by adapting a character for a similar-sounding word. Scholars have used the phonetic information in the script and the rhyming practice of ancient poetry to reconstruct Old Chinese phonology, corresponding roughly to the Western Zhou period in the early part of the 1st millennium BC. Although many of the finer details remain unclear, most scholars agree that Old Chinese differed from Middle Chinese in lacking retroflex and palatal obstruents but having initial consonant clusters of some sort, and in having voiceless nasals and liquids. Most recent reconstructions also describe Old Chinese as a language without tones, but having consonant clusters at the end of the syllable, which developed into tone distinctions in Middle Chinese. Most researchers trace the core vocabulary of Old Chinese to Sino-Tibetan, with much early borrowing from neighbouring languages. During the Zhou period, the originally monosyllabic vocabulary was augmented with polysyllabic words formed by compounding and reduplication. Several derivational affixes have also been identified. However the language lacked inflection, and indicated grammatical relationships using word order and grammatical particles. Although the relationship was first proposed in the early 19th century and is now broadly accepted, reconstruction of Sino-Tibetan is much less developed than that of families such as Indo-European or Austronesian. Although Old Chinese is by far the earliest attested member of the family, its logographic script does not clearly indicate the pronunciation of words. Other difficulties have included the great diversity of the languages, the lack of inflection in many of them, and the effects of language contact. In addition, many of the smaller languages are spoken in mountainous areas that are difficult to reach, including several sensitive border zones. Initial consonants generally correspond regarding place and manner of articulation, but voicing and aspiration are much less regular, and prefixal elements vary widely between languages. Some researchers believe that both these phenomena reflect lost minor syllables. Proto-Tibeto-Burman as reconstructed by Benedict and Matisoff lacks an aspiration distinction on initial stops and affricates. Aspiration in Old Chinese often corresponds to pre-initial consonants in Tibetan and Lolo-Burmese, and is believed to be a Chinese innovation arising from earlier prefixes. Proto-Sino-Tibetan is reconstructed with a six-vowel system as in recent reconstructions of Old Chinese, with the Tibeto-Burman languages distinguished by the merger of the mid-central vowel *-ə- with *-a-. The other vowels are preserved by both, with some alternation between *-e- and *-i-, and between *-o- and *-u-. The earliest known written records of the Chinese language were found at the Yinxu site near modern Anyang identified as the last capital of the Shang dynasty, and date from about 1250 BC. These are the oracle bones, short inscriptions carved on tortoise plastrons and ox scapulae for divinatory purposes, as well as a few brief bronze inscriptions. The language written is undoubtedly an early form of Chinese, but is difficult to interpret due to the limited subject matter and high proportion of proper names. Only half of the 4,000 characters used have been identified with certainty. Little is known about the grammar of this language, but it seems much less reliant on grammatical particles than Classical Chinese. From early in the Western Zhou period, around 1000 BC, the most important recovered texts are bronze inscriptions, many of considerable length. Even longer pre-Classical texts on a wide range of subjects have also been transmitted through the literary tradition. The oldest parts of the Book of Documents, the Classic of Poetry and the I Ching also date from the early Zhou period, and closely resemble the bronze inscriptions in vocabulary, syntax, and style. A greater proportion of this more varied vocabulary has been identified than for the oracular period. The four centuries preceding the unification of China in 221 BC (the later Spring and Autumn period and the Warring States period) constitute the Chinese classical period in the strict sense. There are many bronze inscriptions from this period, but they are vastly outweighed by a rich literature written in ink on bamboo and wooden slips and (toward the end of the period) silk. Although these are perishable materials, and many books were destroyed in the burning of books and burying of scholars in the Qin dynasty, other texts have been transmitted as copies. Such works from this period as the Analects, the Classic of Filial Piety, the Mencius and the Zuo zhuan have been admired as models of prose style since the Han dynasty. The Classical Chinese of such works formed the basis of Literary Chinese, which remained the written standard until the early twentieth century. Each character of the script represented a single Old Chinese word. Most scholars believe that these words were monosyllabic, though some have recently suggested that a minority of them had minor presyllables. The development of these characters follows the same three stages that characterized Egyptian hieroglyphs, Mesopotamian cuneiform script and the Maya script. Some words could be represented by pictures (later stylized) such as 日 rì 'sun', 人 rén 'person' and 木 mù 'tree, wood', by abstract symbols such as 三 sān 'three' and 上 shàng 'up', or by composite symbols such as 林 lín 'forest' (two trees). About 1,000 of the oracle bone characters, nearly a quarter of the total, are of this type, though 300 of them have not yet been deciphered. Though the pictographic origins of these characters are apparent, they have already undergone extensive simplification and conventionalization. Evolved forms of most of these characters are still in common use today. The word lì 'tremble' was originally written with the character 栗 for lì 'chestnut'. The pronoun and modal particle qí was written with the character 其 originally representing jī 'winnowing basket'. The word lì 'tremble' was later written with the character 慄, formed by adding the symbol ⺖, a variant of 心 xīn 'heart'. The less common original word jī 'winnowing basket' came to be written with the compound 箕, obtained by adding the symbol 竹 zhú 'bamboo' to the character. 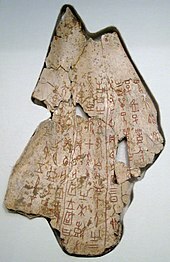 Such phono-semantic compound characters were already used extensively on the oracle bones, and the vast majority of characters created since then have been of this type. In the Shuowen Jiezi, a dictionary compiled in the 2nd century, 82% of the 9,353 characters are classified as phono-semantic compounds. In the light of the modern understanding of Old Chinese phonology, researchers now believe that most of the characters originally classified as semantic compounds also have a phonetic nature. These developments were already present in the oracle bone script, possibly implying a significant period of development prior to the extant inscriptions. This may have involved writing on perishable materials, as suggested by the appearance on oracle bones of the character 册 cè 'records'. The character is thought to depict bamboo or wooden strips tied together with leather thongs, a writing material known from later archaeological finds. Development and simplification of the script continued during the pre-Classical and Classical periods, with characters becoming less pictorial and more linear and regular, with rounded strokes being replaced by sharp angles. The language developed compound words, so that characters came to represent morphemes, though almost all morphemes could be used as independent words. Hundreds of morphemes of two or more syllables also entered the language, and were written with one phono-semantic compound character per syllable. During the Warring States period, writing became more widespread, with further simplification and variation, particularly in the eastern states. The most conservative script prevailed in the western state of Qin, which would later impose its standard on the whole of China. Various initial clusters have been proposed, especially clusters of *s- with other consonants, but this area remains unsettled. Bernhard Karlgren and many later scholars posited the medials *-r-, *-j- and the combination *-rj- to explain the retroflex and palatal obstruents of Middle Chinese, as well as many of its vowel contrasts. *-r- is generally accepted. However, although the distinction denoted by *-j- is universally accepted, its realization as a palatal glide has been challenged on a number of grounds, and a variety of different realizations have been used in recent constructions. Vowels could optionally be followed by the same codas as in Middle Chinese: a glide *-j or *-w, a nasal *-m, *-n or *-ŋ, or a stop *-p, *-t or *-k. Some scholars also allow for a labiovelar coda *-kʷ. Most scholars now believe that Old Chinese lacked the tones found in later stages of the language, but had optional post-codas *-ʔ and *-s, which developed into the Middle Chinese rising and departing tones respectively. Little is known of the grammar of the language of the Oracular and pre-Classical periods, as the texts are often of a ritual or formulaic nature, and much of their vocabulary has not been deciphered. In contrast, the rich literature of the Warring States period has been extensively analysed. Having no inflection, Old Chinese was heavily reliant on word order, grammatical particles, and inherent word classes. Classifying Old Chinese words is not always straightforward, as words were not marked for function, word classes overlapped, and words of one class could sometimes be used in roles normally reserved for a different class. The task is more difficult with written texts than it would have been for speakers of Old Chinese, because the derivational morphology is often hidden by the writing system. For example, the verb *sək 'to block' and the derived noun *səks 'frontier' were both written with the same character 塞. In the oracle bone inscriptions, the *l- pronouns were used by the king to refer to himself, and the *ŋ- forms for the Shang people as a whole. This distinction is largely absent in later texts, and the *l- forms disappeared during the classical period. In the post-Han period, 我 came to be used as the general first-person pronoun. Second-person pronouns included *njaʔ 汝, *njəjʔ 爾, *njə 而, *njak 若. The forms 汝 and 爾 continued to be used interchangeably until their replacement by the northwestern variant 你 (modern Mandarin nǐ) in the Tang period. However, in some Min dialects the second-person pronoun is derived from 汝. Case distinctions were particularly marked among third-person pronouns. There was no third-person subject pronoun, but *tjə 之, originally a distal demonstrative, came to be used as a third-person object pronoun in the classical period. The possessive pronoun was originally *kjot 厥, replaced in the classical period by *ɡjə 其. In the post-Han period, 其 came to be used as the general third-person pronoun. It survives in some Wu dialects, but has been replaced by a variety of forms elsewhere. As in the modern language, localizers (compass directions, 'above', 'inside' and the like) could be placed after nouns to indicate relative positions. They could also precede verbs to indicate the direction of the action. Nouns denoting times were another special class (time words); they usually preceded the subject to specify the time of an action. However the classifiers so characteristic of Modern Chinese only became common in the Han period and the subsequent Northern and Southern dynasties. Old Chinese verbs, like their modern counterparts, did not show tense or aspect; these could be indicated with adverbs or particles if required. Verbs could be transitive or intransitive. As in the modern language, adjectives were a special kind of intransitive verb, and a few transitive verbs could also function as modal auxiliaries or as prepositions. Adverbs described the scope of a statement or various temporal relationships. They included two families of negatives starting with *p- and *m-, such as *pjə 不 and *mja 無. Modern northern varieties derive the usual negative from the first family, while southern varieties preserve the second. The language had no adverbs of degree until late in the Classical period. Particles were function words serving a range of purposes. As in the modern language, there were sentence-final particles marking imperatives and yes/no questions. Other sentence-final particles expressed a range of connotations, the most important being *ljaj 也, expressing static factuality, and *ɦjəʔ 矣, implying a change. Other particles included the subordination marker *tjə 之 and the nominalizing particles *tjaʔ 者 (agent) and *srjaʔ 所 (object).Conjunctions could join nouns or clauses. As with English and modern Chinese, Old Chinese sentences can be analysed as a subject (a noun phrase, sometimes understood) followed by a predicate, which could be of either nominal or verbal type. The copular verb 是 (shì) of Literary and Modern Chinese dates from the Han period. In Old Chinese the word was a near demonstrative ('this'). An additional noun phrase could be placed before the subject to serve as the topic. As in the modern language, yes/no questions were formed by adding a sentence-final particle, and requests for information by substituting an interrogative pronoun for the requested element. A common instance of this construction was adjectival modification, since the Old Chinese adjective was a type of verb (as in the modern language), but 之 was usually omitted after monosyllabic adjectives. Similarly, adverbial modifiers, including various forms of negation, usually occurred before the verb. As in the modern language, time adjuncts occurred either at the start of the sentence or before the verb, depending on their scope, while duration adjuncts were placed after the verb. Instrumental and place adjuncts were usually placed after the verb phrase. These later moved to a position before the verb, as in the modern language. The improved understanding of Old Chinese phonology has enabled the study of the origins of Chinese words (rather than the characters with which they are written). Most researchers trace the core vocabulary to a Sino-Tibetan ancestor language, with much early borrowing from other neighbouring languages. The traditional view was that Old Chinese was an isolating language, lacking both inflection and derivation, but it has become clear that words could be formed by derivational affixation, reduplication and compounding. Most authors consider only monosyllabic roots, but Baxter and Laurent Sagart also propose disyllabic roots in which the first syllable is reduced, as in modern Khmer. During the Old Chinese period, Chinese civilization expanded from a compact area around the lower Wei River and middle Yellow River eastwards across the North China Plain to Shandong and then south into the valley of the Yangtze. There are no records of the non-Chinese languages formerly spoken in those areas and subsequently displaced by the Chinese expansion. However they are believed to have contributed to the vocabulary of Old Chinese, and may be the source of some of the many Chinese words whose origins are still unknown. Jerry Norman and Mei Tsu-lin have identified early Austroasiatic loanwords in Old Chinese, possibly from the peoples of the lower Yangtze basin known to ancient Chinese as the Yue. For example, the early Chinese name *kroŋ (江 jiāng) for the Yangtze was later extended to a general word for 'river' in south China. Norman and Mei suggest that the word is cognate with Vietnamese sông (from *krong) and Mon kruŋ 'river'. Other words are believed to have been borrowed from languages to the south of the Chinese area, but it is not clear which was the original source, e.g. *zjaŋʔ (象 xiàng) 'elephant' can be compared with Mon coiŋ, proto-Tai *jaŋC and Burmese chaŋ. *ke (雞 jī) 'chicken' versus proto-Tai *kəiB proto-Hmong–Mien *kai and proto-Viet–Muong *r-ka. In ancient times, the Tarim Basin was occupied by speakers of Indo-European Tocharian languages, the source of *mjit (蜜 mì) 'honey', from proto-Tocharian *ḿət(ə) (where *ḿ is palatalized; cf. Tocharian B mit), cognate with English mead. [g] The northern neighbours of Chinese contributed such words as *dok (犢 dú) 'calf' – compare Mongolian tuɣul and Manchu tuqšan. Chinese philologists have long noted words with related meanings and similar pronunciations, sometimes written using the same character.Henri Maspero attributed some of these alternations to consonant clusters resulting from derivational affixes. Subsequent work has identified several such affixes, some of which appear to have cognates in other Sino-Tibetan languages. Some scholars hold that the transitive verbs with voiceless initials are basic and the voiced initials reflect a de-transitivizing nasal prefix. Others suggest that the transitive verbs were derived by the addition of a causative prefix *s- to a stative verb, causing devoicing of the following voiced initial. Both postulated prefixes have parallels in other Sino-Tibetan languages, in some of which they are still productive. Several other affixes have been proposed. full reduplication, in which the syllable is repeated, as in *ʔjuj-ʔjuj (威威 wēiwēi) 'tall and grand' and *ljo-ljo (俞俞 yúyú) 'happy and at ease'. rhyming semi-reduplication, in which only the final is repeated, as in *ʔiwʔ-liwʔ (窈宨 yǎotiǎo) 'elegant, beautiful'. The initial of the second syllable is often *l- or *r-. alliterative semi-reduplication, in which the initial is repeated, as in *tsʰrjum-tsʰrjaj (參差 cēncī) 'irregular, uneven'. vowel alternation, especially of *-e- and *-o-, as in *tsʰjek-tsʰjok (刺促 qìcù) 'busy' and *ɡreʔ-ɡroʔ (邂逅 xièhòu) 'carefree and happy'. qualification of one noun by another (placed in front), as in *mok-kʷra (木瓜 mùguā) 'quince' (literally 'tree-melon'), and *trjuŋ-njit (中日 zhōngrì) 'noon' (literally 'middle-day'). verb–object compounds, as in *sjə-mraʔ (司馬 sīmǎ) 'master of the household' (literally 'manage-horse'), and *tsak-tsʰrek (作册 zuòcè) 'scribe' (literally 'make-writing'). However the components of compounds were not bound morphemes: they could still be used separately. A number of bimorphemic syllables appeared in the Classical period, resulting from the fusion of words with following unstressed particles or pronouns. Thus the negatives *pjut 弗 and *mjut 勿 are viewed as fusions of the negators *pjə 不 and *mjo 毋 respectively with a third-person pronoun *tjə 之. ^ The time interval assigned to Old Chinese varies between authors. Some scholars limit it to the early Zhou period, based on the availability of documentary evidence of the phonology. Many include the whole Zhou period and often the earliest written evidence from the late Shang period, while some also include the Qin, Han and occasionally even later periods. The ancestor of the oldest layer of the Min dialects is believed to have split off during the Han period. ^ Reconstructed Old Chinese forms are starred, and follow Baxter (1992) with some graphical substitutions from his more recent work: *ə for *ɨ and consonants rendered according to IPA conventions. ^ The notation "*C-" indicates that there is evidence of an Old Chinese consonant before *r, but the particular consonant cannot be identified. ^ Baxter describes his reconstruction of the palatal initials as "especially tentative, being based largely on scanty graphic evidence". ^ The vowel here written as *ə is treated as *ɨ, *ə or *ɯ by different authors. ^ The six-vowel system represents a re-analysis of a system proposed by Li and still used by some authors, comprising four vowels *i, *u, *ə and *a and three diphthongs. Li's diphthongs *ia and *ua correspond to *e and *o respectively, while Li's *iə becomes *i or *ə in different contexts. ^ Jacques proposed a different, unattested, Tocharian form as the source. Meier & Peyrot recently defended traditional Tocharian etymology. ^ Shaughnessy (1999), p. 298. ^ Tai & Chan (1999), pp. 225–233. ^ Baxter & Sagart (2014), p. 33. ^ Norman (1988), pp. 8–12. ^ Enfield (2005), pp. 186–193. ^ Coblin (1986), pp. 35–164. ^ Norman (1988), p. 13. ^ Schuessler (2007), p. 122. ^ GSR 58f; Baxter (1992), p. 208. ^ a b c d e f g h i j Hill (2012), p. 46. ^ GSR 94j; Baxter (1992), p. 453. ^ Hill (2012), p. 48. ^ GSR 103a; Baxter (1992), p. 47. ^ GSR 564a; Baxter (1992), p. 317. ^ a b Hill (2012), p. 8. ^ GSR 648a; Baxter (1992), p. 785. ^ a b c d e f Hill (2012), p. 27. ^ GSR 58a; Baxter (1992), p. 795. ^ Baxter (1992), p. 201. ^ GSR 1032a; Baxter (1992), p. 774. ^ GSR 404a; Baxter (1992), p. 785. ^ a b c d Hill (2012), p. 9. ^ GSR 826a; Baxter (1992), p. 777. ^ a b Hill (2012), p. 12. ^ GSR 981a; Baxter (1992), p. 756. ^ a b Hill (2012), p. 15. ^ GSR 399e; Baxter (1992), p. 768. ^ GSR 79a; Baxter (1992), p. 209. ^ GSR 49u; Baxter (1992), p. 771. ^ GSR 319d; Baxter (1992), p. 407. ^ a b Hill (2012), p. 51. ^ GSR 1016a; Baxter (1992), p. 520. ^ Norman (1988), p. 14. ^ Handel (2008), pp. 434–436. ^ Norman (1988), pp. 15–16. ^ Coblin (1986), p. 11. ^ Handel (2008), pp. 425–426. ^ Schuessler (2007), pp. 58–63. ^ Gong (1980), pp. 476–479. ^ Schuessler (2007), pp. 2, 105. ^ Schuessler (2007), pp. 110–117. ^ Baxter & Sagart (2014), p. 1. ^ Boltz (1999), pp. 88–89. ^ Boltz (1999), p. 89. ^ Boltz (1999), p. 90. ^ a b Norman (1988), p. 58. ^ a b Baxter & Sagart (2014), pp. 50–53. ^ Boltz (1994), pp. 52–72. ^ Boltz (1999), p. 109. ^ a b Wilkinson (2012), p. 36. ^ Boltz (1994), pp. 52–57. ^ Boltz (1994), pp. 59–62. ^ Boltz (1999), pp. 114–118. ^ a b GSR 403; Boltz (1999), p. 119. ^ a b GSR 952; Norman (1988), p. 60. ^ Boltz (1994), pp. 67–72. ^ Wilkinson (2012), pp. 36–37. ^ Boltz (1994), pp. 147–149. ^ Schuessler (2009), pp. 31–32, 35. ^ Boltz (1999), p. 110. ^ Boltz (1999), p. 107. ^ Norman (1988), pp. 61–62. ^ Boltz (1994), pp. 171–172. ^ Norman (1988), pp. 62–63. ^ Schuessler (2009), p. x. ^ Li (1974–1975), p. 237. ^ Norman (1988), p. 46. ^ Baxter (1992), pp. 188–215. ^ Baxter (1992), p. 203. ^ Baxter (1992), pp. 222–232. ^ Baxter (1992), pp. 235–236. ^ Schuessler (2007), p. 95. ^ Baxter & Sagart (2014), pp. 68–71. ^ Baxter (1992), p. 180. ^ Li (1974–1975), p. 247. ^ Baxter (1992), pp. 253–256. ^ Handel (2003), pp. 556–557. ^ Baxter (1992), p. 291. ^ a b Herforth (2003), p. 59. ^ Norman (1988), pp. 87–88. ^ a b Herforth (2003), p. 60. ^ Aldridge (2013), pp. 41–42. ^ Baxter (1992), p. 136. ^ a b Norman (1988), p. 89. ^ a b Pulleyblank (1996), p. 76. ^ a b c d Norman (1988), p. 118. ^ Pulleyblank (1996), p. 77. ^ Sagart (1999), p. 143. ^ a b Aldridge (2013), p. 43. ^ Pulleyblank (1996), p. 79. ^ Pulleyblank (1996), p. 80. ^ Norman (1988), pp. 90–91. ^ a b Norman (1988), p. 91. ^ Schuessler (2007), pp. 70, 457. ^ Norman (1988), pp. 91, 94. ^ Norman (1988), pp. 115–116. ^ Norman (1988), pp. 91–94. ^ Norman (1988), p. 94. ^ Norman (1988), pp. 97–98. ^ Schuessler (2007), pp. 172–173, 518–519. ^ Norman (1988), pp. 94, 127. ^ Norman (1988), pp. 94, 98–100, 105–106. ^ Norman (1988), pp. 94, 106–108. ^ Pulleyblank (1996), pp. 13–14. ^ Norman (1988), p. 95. ^ Pulleyblank (1996), p. 22. ^ a b Schuessler (2007), p. 14. ^ Pulleyblank (1996), pp. 16–18, 22. ^ Schuessler (2007), p. 232. ^ Norman (1988), pp. 125–126. ^ a b Pulleyblank (1996), p. 14. ^ Norman (1988), pp. 10–11, 96. ^ Pulleyblank (1996), p. 13. ^ Herforth (2003), pp. 66–67. ^ Norman (1988), pp. 90–91, 98–99. ^ a b c Pulleyblank (1996), p. 62. ^ Norman (1988), pp. 104–105. ^ Norman (1988), p. 105. ^ Norman (1988), pp. 103–104. ^ Norman (1988), pp. 103, 130–131. ^ Schuessler (2007), pp. xi, 1–5, 7–8. ^ Baxter & Sagart (1998), pp. 35–36. ^ Norman (1988), pp. 4, 16–17. ^ Boltz (1999), pp. 75–76. ^ Norman & Mei (1976), pp. 280–283. ^ Norman (1988), pp. 17–18. ^ Baxter (1992), p. 573. ^ Haudricourt & Strecker (1991); Baxter (1992), p. 753; GSR 1078h; Schuessler (2007), pp. 207–208, 556. ^ Norman (1988), p. 19; GSR 728a; OC from Baxter (1992), p. 206. ^ Schuessler (2007), p. 292; GSR 876n; OC from Baxter (1992), p. 578. ^ Boltz (1999), p. 87; Schuessler (2007), p. 383; Baxter (1992), p. 191; GSR 405r; Proto-Tocharian and Tocharian B forms from Peyrot (2008), p. 56. ^ Meier & Peyrot (2017). ^ Norman (1988), p. 18; GSR 1023l. ^ Handel (2015), p. 76. ^ Sagart (1999), p. 1. ^ Maspero (1930), pp. 323–324. ^ Baxter & Sagart (2014), pp. 53–60. ^ Schuessler (2007), pp. 14–22. ^ Downer (1959), pp. 258–259. ^ GSR 381a,c; Baxter (1992), p. 768; Schuessler (2007), p. 45. ^ GSR 393p,t; Baxter (1992), p. 315. ^ GSR 695h,e; Baxter (1992), p. 315; Schuessler (2007), p. 45. ^ GSR 920f; Baxter (1992), p. 178; Schuessler (2007), p. 16. ^ Schuessler (2007), p. 49. ^ GSR 241a,e; Baxter (1992), p. 218. ^ GSR 1166a, 1167e; Baxter (1992), p. 801. ^ GSR 721h,a; Baxter (1992), p. 324. ^ Handel (2012), pp. 63–64, 68–69. ^ Handel (2012), pp. 63–64, 70–71. ^ Handel (2012), pp. 65–68. ^ Sun (2014), pp. 638–640. ^ Baxter & Sagart (1998), pp. 45–64. ^ Schuessler (2007), pp. 38–50. ^ Wilkinson (2012), pp. 22–23. ^ a b Norman (1988), p. 87. ^ a b Baxter & Sagart (1998), p. 65. ^ Schuessler (2007), p. 24. ^ Baxter & Sagart (1998), pp. 65–66. ^ GSR 633h; Baxter (1992), p. 411. ^ Baxter & Sagart (1998), p. 67. ^ Baxter & Sagart (1998), p. 68. ^ Norman (1988), p. 86. ^ Norman (1988), pp. 85, 98. Aldridge, Edith (2013), "Survey of Chinese historical syntax part I: pre-Archaic and Archaic Chinese", Language and Linguistics Compass, 7 (1): 39–57, doi:10.1111/lnc3.12006. Baxter, William H.; Sagart, Laurent (1998), "Word formation in Old Chinese", in Packard, Jerome Lee (ed. ), New approaches to Chinese word formation: morphology, phonology and the lexicon in modern and ancient Chinese, Berlin: Walter de Gruyter, pp. 35–76, ISBN 978-3-11-015109-1. ———; ——— (2014), Old Chinese: A New Reconstruction, Oxford University Press, ISBN 978-0-19-994537-5. Boltz, William (1994), The origin and early development of the Chinese writing system, American Oriental Society, ISBN 978-0-940490-78-9. ——— (1999), "Language and Writing", in Loewe, Michael; Shaughnessy, Edward L. (eds. ), The Cambridge History of Ancient China, Cambridge: Cambridge University Press, pp. 74–123, ISBN 978-0-521-47030-8. Downer, G. B. (1959), "Derivation by Tone-Change in Classical Chinese", Bulletin of the School of Oriental and African Studies, 22 (1/3): 258–290, doi:10.1017/s0041977x00068701, JSTOR 609429. Enfield, N.J. (2005), "Areal Linguistics and Mainland Southeast Asia" (PDF), Annual Review of Anthropology, 34: 181–206, doi:10.1146/annurev.anthro.34.081804.120406. Gong, Hwang-cherng (1980), "A Comparative Study of the Chinese, Tibetan, and Burmese Vowel Systems", Bulletin of the Institute of History and Philology, Academia Sinica, 51: 455–489. Handel, Zev J. (2003), "Appendix A: A Concise Introduction to Old Chinese Phonology", in Matisoff, James (ed. ), Handbook of Proto-Tibeto-Burman: System and Philosophy of Sino-Tibetan Reconstruction, Berkeley: University of California Press, pp. 543–576, ISBN 978-0-520-09843-5. ——— (2008), "What is Sino-Tibetan? Snapshot of a field and a language family in flux", Language and Linguistics Compass, 2 (3): 422–441, doi:10.1111/j.1749-818x.2008.00061.x. ——— (2012), "Valence-changing prefixes and voicing alternation in Old Chinese and Proto-Sino-Tibetan: reconstructing *s- and *N- prefixes" (PDF), Language and Linguistics, 13 (1): 61–82. ——— (2015), "Old Chinese Phonology", in S-Y. Wang, William; Sun, Chaofen (eds. ), The Oxford Handbook of Chinese Linguistics, Oxford: Oxford University Press, pp. 68–79, ISBN 978-0-19-985633-6. Haudricourt, André G.; Strecker, David (1991), "Hmong–Mien (Miao–Yao) loans in Chinese", T'oung Pao, 77 (4–5): 335–342, doi:10.1163/156853291X00073, JSTOR 4528539. Herforth, Derek (2003), "A sketch of Late Zhou Chinese grammar", in Thurgood, Graham; LaPolla, Randy J. (eds. ), The Sino-Tibetan languages, London: Routledge, pp. 59–71, ISBN 978-0-7007-1129-1. Hill, Nathan W. (2012), "The six vowel hypothesis of Old Chinese in comparative context", Bulletin of Chinese Linguistics, 6 (2): 1–69. Jacques, Guillaume (2014), "The word for 'honey' in Chinese and its relevance for the study of Indo-European and Sino-Tibetan language contact", *Wékwos, 1: 111–116. Karlgren, Bernhard (1957), Grammata Serica Recensa, Stockholm: Museum of Far Eastern Antiquities, OCLC 1999753. Li, Fang-Kuei (1974–1975), translated by Mattos, Gilbert L., "Studies on Archaic Chinese", Monumenta Serica, 31: 219–287, JSTOR 40726172. Maspero, Henri (1930), "Préfixes et dérivation en chinois archaïque", Mémoires de la Société de Linguistique de Paris (in French), 23 (5): 313–327. Meier, Kristin; Peyrot, Michaël (2017), "The Word for 'Honey' in Chinese, Tocharian and Sino-Vietnamese", Zeitschrift der Deutschen Morgenländischen Gesellschaft, 167 (1): 7–22, doi:10.13173/zeitdeutmorggese.167.1.0007. Norman, Jerry; Mei, Tsu-lin (1976), "The Austroasiatics in Ancient South China: Some Lexical Evidence" (PDF), Monumenta Serica, 32: 274–301, JSTOR 40726203. Peyrot, Michaël (2008), Variation and Change in Tocharian B, Amsterdam: Rodopoi, ISBN 978-90-420-2401-4. Pulleyblank, Edwin G. (1996), Outline of Classical Chinese Grammar, University of British Columbia Press, ISBN 978-0-7748-0541-4. ——— (2009), Minimal Old Chinese and Later Han Chinese: A Companion to Grammata Serica Recensa, Honolulu: University of Hawaii Press, ISBN 978-0-8248-3264-3. Shaughnessy, Edward L. (1999), "Western Zhou History", in Loewe, Michael; Shaughnessy, Edward L. (eds. ), The Cambridge History of Ancient China, Cambridge: Cambridge University Press, pp. 292–351, ISBN 978-0-521-47030-8. Sun, Jackson T.-S. (2014), "Sino-Tibetan: Rgyalrong", in Lieber, Rochelle; Štekauer, Pavol (eds. ), The Oxford Handbook of Derivational Morphology, Oxford: Oxford University Press, pp. 630–650, ISBN 978-0-19-165177-9. Tai, James H-Y. ; Chan, Marjorie K.M. (1999), "Some reflections on the periodization of the Chinese language" (PDF), in Peyraube, Alain; Sun, Chaofen (eds. ), In Honor of Mei Tsu-Lin: Studies on Chinese Historical Syntax and Morphology, Paris: Ecole des Hautes Etudes en Sciences Sociales, pp. 223–239, ISBN 978-2-910216-02-3. Wilkinson, Endymion (2012), Chinese History: A New Manual, Harvard University Press, ISBN 978-0-674-06715-8. Dobson, W.A.C.H. (1959), Late Archaic Chinese: A Grammatical Study, Toronto: University of Toronto Press, ISBN 978-0-8020-7003-6. ——— (1962), Early Archaic Chinese: A Descriptive Grammar, Toronto: University of Toronto Press, OCLC 186653632. Jacques, Guillaume (2016), "The Genetic Position of Chinese", in Sybesma, Rint; Behr, Wolfgang; Gu, Yueguo; Handel, Zev; Huang, C.-T. James; Myers, James (eds. ), Encyclopedia of Chinese Languages and Linguistics, BRILL, ISBN 978-90-04-18643-9. Miyake, Marc (2011). "Why are rhinos late?". Old Chinese articles. Miyake, Marc (2012). "A *slo-lution to the p-ro-blem". Old Chinese articles. Miyake, Marc (2013). "Pri-zu-ner". Old Chinese articles. Miyake, Marc (2013). "Did Old Chinese palatal initials always condition higher vowels?". Old Chinese articles. Miyake, Marc (2013). "Are Old Chinese disharmonic disyllabic words borrowings?". Old Chinese articles. Miyake, Marc (2015). "Did Old Chinese really have so much *(-)r-?". Old Chinese articles.